With Valentines Day coming up we decided to get crafty and some of our favourite books provided us with inspiration. We didn’t need to buy anything new for these crafts, we already had everything we needed at home – biscuit cutters make great heart templates! We used craft foam (you could also use thick card), pipe cleaners and wiggly eyes. We stamped heart shaped biscuit cutters into the foam to make eight hearts then cut the hearts out (you could also draw round them but the stamping was fun!). We stuck them together in a line before flipping the book mark over to stick a larger heart on as a head. We made the antennae by sticking smaller hearts onto short pipe cleaners. Wiggly eyes and glitter glue completed the face. We had so much fun with this one that we made The Very Hungry Caterpillar a girlfriend! We thought that the unloved, neglected and warring crayons in The Day the Crayons Quit would appreciate a new pencil tin. We covered a tin with a double thickness of fabric, folded the excess over the top, glued it with a clear craft glue then did the same with the base. We stuck a card circle onto the base to hide the fabric edges. Then it was time to decorate. We found ribbon and buttons in our sewing box and felt hearts in the sticker box. My daughter decided where she wanted to stick everything and I helped her glue everything on. We finished with a ribbon around the top edge. 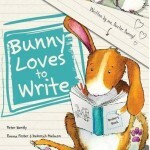 This would also be a great Valentines Day present for Buster in Bunny Loves to Write. Robber dogs, Shifty McGifty and Slippery Sam inspired us to make Valentines Day biscuits. We made dough (200g flour, 125g butter, 1 egg yolk, 1 packet vanilla sugar and 50g sugar) then cut out circles and hearts. My daughter enjoyed cutting the smaller shapes out of the middle of the bigger shapes. We baked them (8 minutes at 200 degrees) and once they were cool we sandwiched them together with cherry jam. 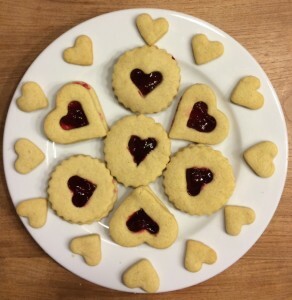 Our own Valentines Day jammy dodgers! 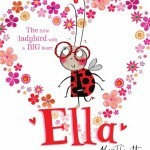 Ella inspired us to make our own ladybird Valentines Day headband. We used red card for the headband then added a black semicircular face with wiggly eyes. 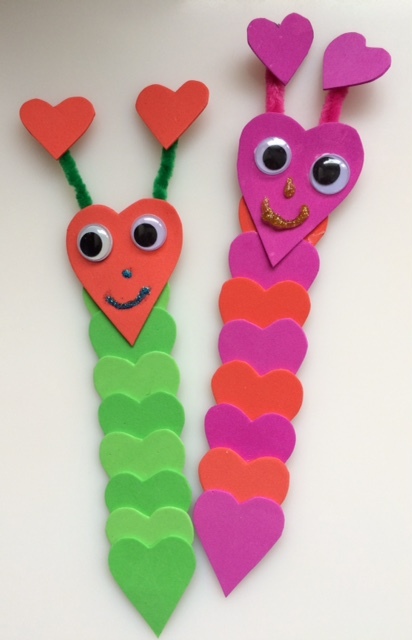 We cut out black hearts for the spots, large pink heart wings and used small pink hearts and pipe cleaners for the antennae. We were originally going to make Sarah, Percy and Bill from Owl Babies but then my daughter decided she wanted to make Plop from The Owl Who Was Afraid of The Dark as he eats a lot in the story! I made some heart templates then we cut them out. 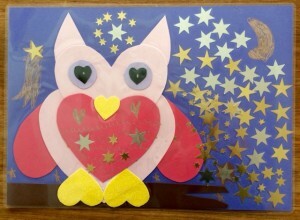 First we gave Plop a branch then stuck the hearts together in an owl shape. A (very!) starry sky completed the picture which we laminated to use as a placemat. We have fun with the crafts and it’s great to have a story to inspire them. 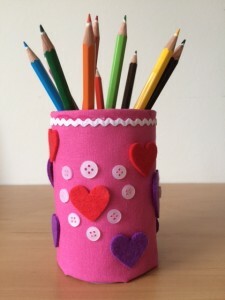 Lots of fab craft ideas. I love those bookmarks! Great to bring books to life. The bookmarks were really easy to make, we enjoyed making them. How adorable – it’s always great to see what each other has for the fun day!! Thank you Louise. 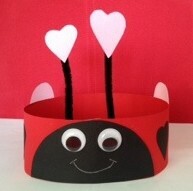 The ladybird headband was fun to make, one day we’d like to make some other ‘bugbands’! Wow, these are fantastic! 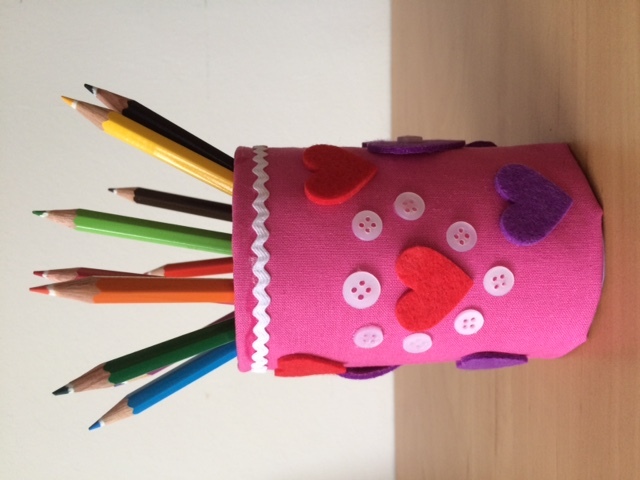 What a perfect addition to a book gift for Valentine’s Day / International Book Giving Day 🙂 Thanks for the post and for sharing on the Kid Lit Blog Hop. That was the idea, to combine books for International Book Giving Day with Valentines Day presents. 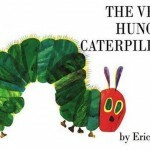 We’re giving The Very Hungry Caterpillar bookmarks away some of our book gifts this year. I am LOVING those Hungry Caterpillar bookmarks. So cute! 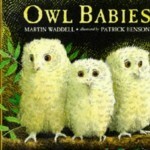 Owl Babies is a great story isn’t it. 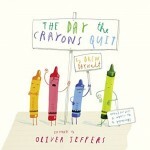 It’s the story that I recommend to parents whose children are suffering from separation anxiety. So much fun! I love all these craft ideas and so will my kiddos! I love crafts that go with books! Thanks for linking up at the Thoughtful Spot Weekly Blog Hop! We hope you’ll join us again next week! Often books stimulate my daughter’s imagination. She’s just made a house for Teddy Robinson after she received the book on International Book Giving Day. The caterpillars are really easy to make, they’re breeding around here 😉 !